I’ve been waiting months for the right moment to make this cake, and a few days ago the opportunity finally presented itself. Waiting, of course, is a little uncharacteristic for me in matters such as these; when a recipe speaks to me as loudly as this one did, I tend to go directly from page to kitchen (or at least to the market to purchase the necessary ingredients). But this was for a fruit-based cake, and since I know such things have a tendency to turn soggy fast, more mouths than just mine and Alfredo’s would be needed to properly enjoy it—numbers I only recently found myself with. The interesting thing, though, and the point of this preamble, is that I continued to think about the recipe long after I came across it. That’s notable because fruit-based desserts don’t usually have that effect on me. I like them fine (as witnessed by the number presented here over the past year) but they’re not generally the sort of thing to get under my skin. What haunted me about this dessert, though, was the description of its texture: custardy at the base, a layer of light, airy cake floating above. That cakey/custardy combo struck a chord, and though I couldn’t say precisely what or when, it recalled for me a vague memory of the pastries I’d sampled (and marveled over) at my local patisserie many years ago when I was a student in France. That French connection is no surprise, as it was the experience of biting into a slice of apple cake in a Paris bistro that inspired the writer of the recipe to create it in the first place (the restaurant’s owner refused to share either her own recipe, or the secret for achieving those contrasting layers, leaving him no choice but to figure it out for himself). What is surprising, however, is the force with which that college era memory came rushing back once I read the recipe. 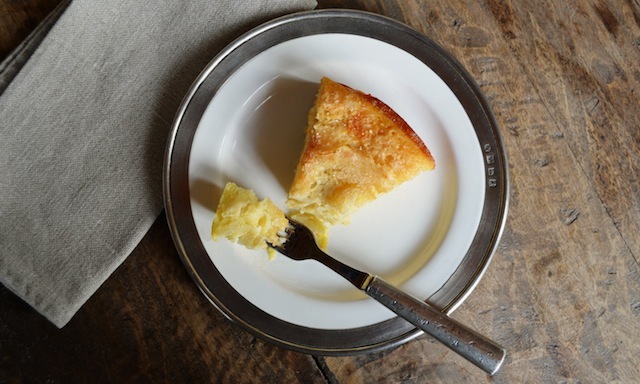 And to compound my reaction, the creamy quality described in the text recalled for me another French dessert I have a weakness for, clafoutis—a dessert that’s part custard, part puffy pancake, and wholly delicious. In short, the apple cake was something I had to try. Like so much of what’s found in Cook’s Illustrated, one of the satisfactions of this recipe—not to mention the accompanying narrative—is the knowledge that the writer left no stone unturned in his effort to deliver a dish that satisfies on every level. That came down to resolving two principal challenges: 1) finding a way to cook the apples so they came off as neither tough nor soggy in the finished product, and 2) unlocking the secret for baking a single layer cake that somehow manages to comprise two distinct textures. 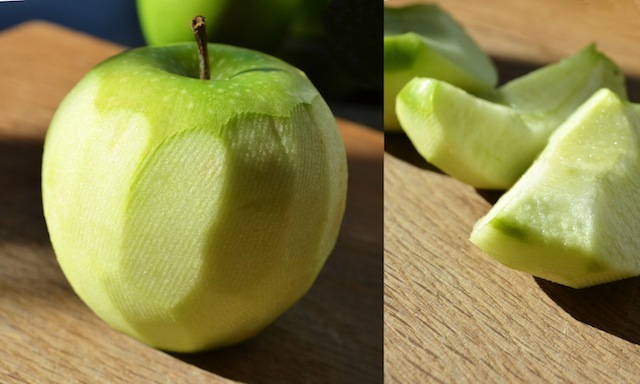 The apple issue he resolved by giving the fruit (peeled, cored, and carved into bite-size slices) a quick spin in the microwave, just long enough for it to become pliable and nearly translucent. According to the recipe this should take about three minutes, though I found four minutes to be more like it. 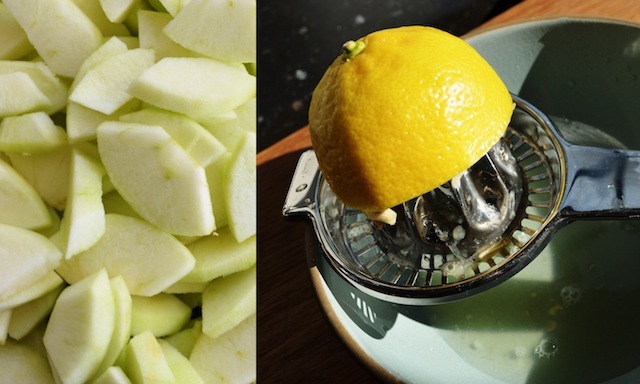 Either way, once the desired degree of doneness has been achieved, the apple slices are given a quick toss with some lemon juice and Calvados (a.k.a. apple brandy), a combination that helps to round out the flavors. 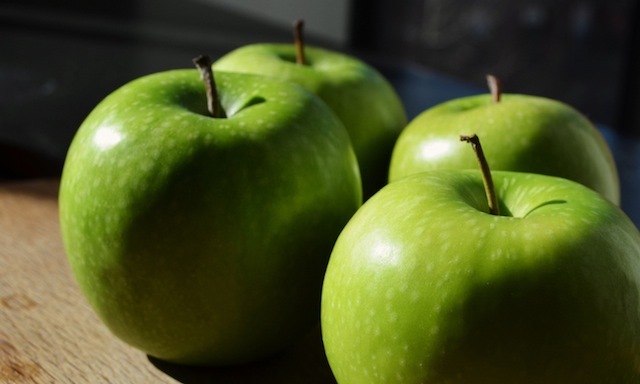 This last addition also saves you from having to use a range of apples—something that’s good for taste but which can compound the sogginess issue, as different varieties release varying amounts of moisture. And the mystery of the dueling textures he sorted out not by creating two different batters (a time consuming process no one would want to take on), but by simply dividing one basic batter into two parts. Once divided he could then add different ingredients to each portion to achieve the desired consistency—extra egg yolks for the custard layer, extra flour for the cakey-er top portion. 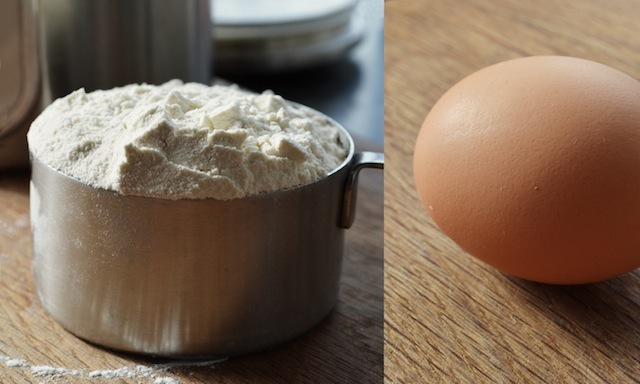 And as for that base batter, this is nothing more complex than a mixture of dry ingredients (a cup each of flour and granulated sugar, plus a little salt and baking powder) combined with the wet items (an egg, a cup each of vegetable oil and whole milk, plus a teaspoon of vanilla). In other words, simple steps for a complex finish. 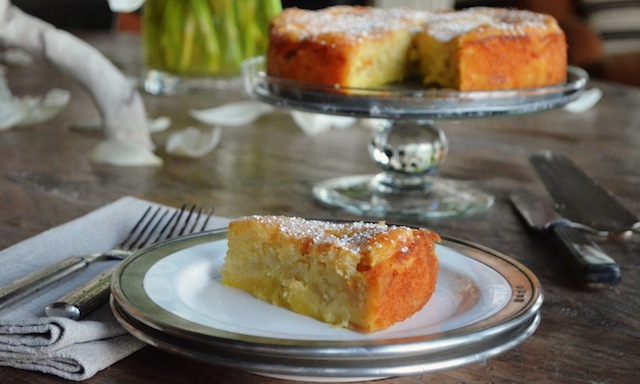 Since it’s the custardy bottom layer of the cake that holds the fruit, once the cup of batter has been measured off and set aside, it’s time to beat in the egg yolks and fold in the apple slices. This mixture is then poured into a 9-inch spring form pan (well-coated with vegetable spray to ensure your baked cake won’t cling to the side of the pan) and smoothed with an offset spatula (a standard variety spatula will work fine too, just proceed with caution). Next up is the reserved, flour-enhanced batter, which is poured across the surface of the more custardy variety. And no, you needn’t worry about the two types of batter merging in the pan—obviously you want to be gentle as your spread the second batter across the surface of the first, but the different densities of the two types seems to ensure the layers stay nicely distinct, even in their uncooked state. All that remains at this point is to sprinkle the surface of the cakey-er layer with a tablespoon of granulated sugar (an addition that ensures the baked top will have a nicely browned and crackly exterior) and to slip it into a 325˚ oven for an hour and fifteen minutes. 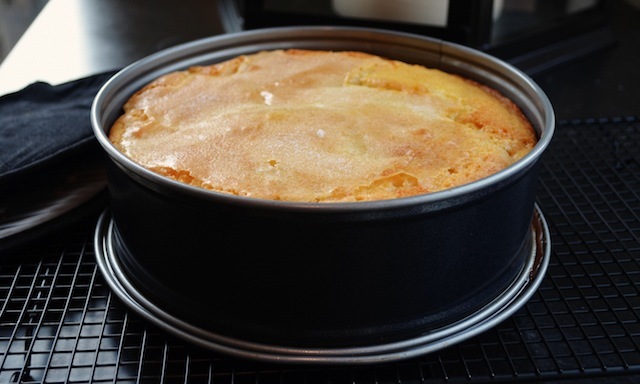 That may seem an eternity to wait, especially given the rich buttery smells emanating from your kitchen, but gird yourself because once out of the oven, the cake still requires several hours more to cool completely. (Such is the nature of that custard/fruit combo that if sliced too soon the cake risks collapsing into a gloppy mess). Still, the reward for patience here is well worth it: lots of bright apple flavor delivered in a tidy package offering a miraculous combination of textures. And easily achieved too—literally a piece of cake! One final thought: as I savored the cake on multiple occasions (hey, I’d waited a long time for this) my taste buds kept looking for a hint of almond. Was this simply an echo of yet another dessert I’d sampled years before in France, or was it a flash of inspiration? I can’t say for certain, but what I can say is that the next time I make this cake I’ll be substituting a tablespoon of Amaretto for the Calvados listed in the recipe. Something about the perfume-y flavor of the almond liqueur merging with the mellow sweetness of the apples strikes me as a combo that can’t miss, and it’s one that again has me pacing the kitchen, waiting for my opportunity to strike. —Adjust oven rack to lower-middle position and heat oven to 325˚. Spray a 9” springform pan with vegetable oil spray. Place prepared pan on rimmed baking sheet lined with aluminum foil. Place apple slices into microwave-safe pie plate, cover, and microwave until apples are pliable and slightly translucent, about 3 minutes. 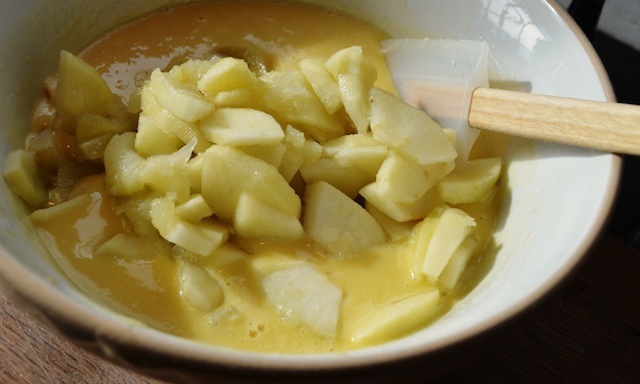 Toss apple slices with Calvados and lemon juice and let cool for 15 minutes. —Whisk 1 cup flour, 1 cup granulated sugar, baking powder, and salt together in bowl. Whisk egg, oil, milk, and vanilla together in second bowl until smooth. Add dry ingredients to wet ingredients and whisk until just combined. Transfer 1 cup batter to separate bowl and set aside. 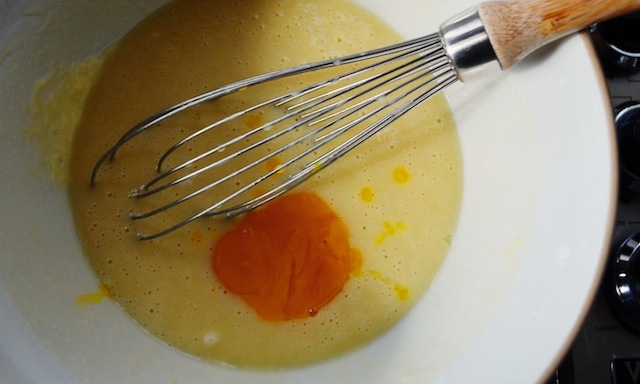 —Add egg yolks to remaining batter and whisk to combine. Using spatula, gently fold in cooled apples. 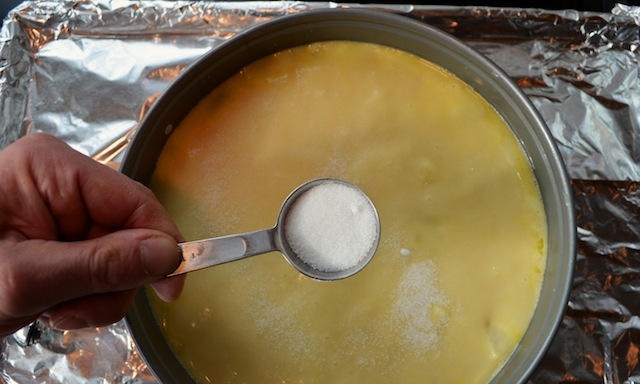 Transfer batter to prepared pan; using offset spatula, spread batter evenly to pan edges, gently pressing on apples to create even, compact layer, and smooth surface. 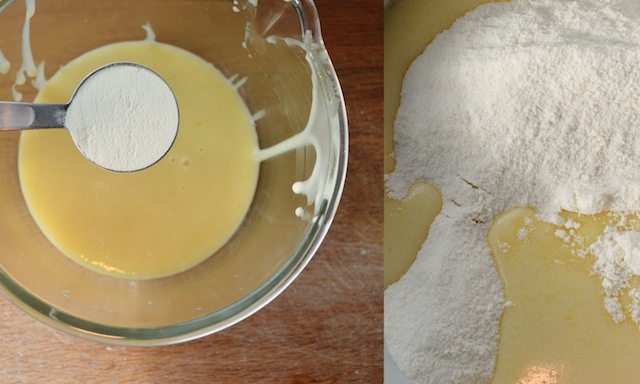 —Whisk remaining 2 tbs flour into reserved batter. 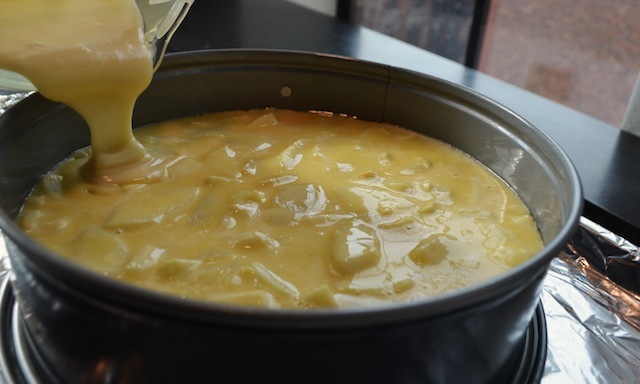 Pour over batter in pan and spread evenly to pan edges and smooth surface. Sprinkle remaining 1 tbs granulated sugar evenly over cake. —Bake until center of cake is set, a toothpick inserted in center comes out clean, and top is golden brown, about 1¼ hours. Transfer pan to wire rack; let cool for 5 minutes. Run paring knife around sides of pan and let cool completely, 2 to 3 hours. Dust lightly with confectioners’ sugar, cut into wedges, and serve.